The Chilean Government asked us to resolve the following equation: To settle the 100 families of the Quinta Monroy in the same 5.000 m2 site that they have illegally occupied for the last 30 years; located in the very center of Iquique, a city in the Chilean desert. We had to work within the framework of the current Housing Policy, using a US$ 7,500 subsidy with which we had to pay for the land, the infrastructure and the architecture. Considering the current values in the Chilean building industry, US$ 7.500 allows for just around 30 m2 of built space. And despite the site’s price (3 times more than what social housing can normally afford) the aim was to settle the families in the same site, instead of displacing them to the periphery. If to answer the question, one starts assuming 1 house = 1 family = 1 lot, we were able to host just 30 families in the site. The problem with isolated houses is that they are very inefficient in terms of land use. As a result, social housing tends to look for land that costs as little as possible. That land is normally far away from work, education, transportation and health care opportunities that cities provide. This way of operating has tended to localize social housing in an impoverished urban sprawl, creating belts of resentment, social conflict and inequity. In order to make a more efficient use of the land, we worked with row houses. Even if we reduced the width of the lot until making it coincident with the width of the house, or furthermore to the width of a room, we were still only able to house 66 families. The problem with this type is that whenever a family wants to add a new room, it blocks access to light and ventilation of previous rooms. Moreover, it compromises privacy because circulation has to be done through other rooms. What we get then, instead of efficiency, is overcrowding and promiscuity. Finally, we could have gone for the high-rise building, which is very efficient in terms of land use, but this type blocks expansions and here we needed that every house could at least double the initial built space. Our first task was to find a new way of looking at the problem, shifting our mindset from the scale of the best possible U$ 7500 unit to be multiplied a 100 times, to the scale of the best possible U$750,000 building capable of accommodating 100 families and their expansions. We observed, however, that a building blocks expansions except for on the ground and the top floor. So, we worked in a building that had just the ground and top floor. We think that social housing should be seen as an investment and not as an expense. So we had to make sure that the initial subsidy could add value over time. All of us, when buying a house, expect it to increase in value. But social housing, in an unacceptable proportion, is more similar to buying a car rather than a house; every day its value decreases. It is crucial to correct this problem because Chile alone will spend 10 billion dollars in the next 20 years to overcome the housing deficit. But also at the small family scale, the housing subsidy received from the State will be, by far, the biggest aid ever. So, if that subsidy can add value over time, it could mean the key turning point to leave poverty. We in Elemental have identified a set of design conditions through which a housing unit can increase its value over time, without having to increase the amount of money of the current subsidy. First, we had to achieve enough density – without overcrowding – in order to be able to pay for the site, which because of its location was very expensive. To keep the site meant to maintain the network of opportunities that the city offered and therefore to strengthen the family economy. On the other hand, good location is a key point in increasing a property’s value. Second, the provision of a physical space for the “extended family” to develop has proved to be a key issue in the economical take off of a poor family. In between the private and public space, we introduced the collective space, conformed by approximately 20 families. The collective space (a common property with restricted access) is an intermediate level of association that allows surviving fragile social conditions. Third, due to the fact that 50% of each unit’s volume will eventually be self-built, the building had to be porous enough to allow each unit to expand within its structure. The initial building must therefore provide a supporting, (rather than a constraining) framework in order to avoid any negative effects of self-construction on the urban environment over time, but also to facilitate the expansion process. Finally, instead a designing a small house (in 30 m2 everything is small), we provided a middle-income house, out of which we were giving just a small part now. This meant a change in the standard: kitchens, bathrooms, stairs, dividing walls and all the difficult parts of the house had to be designed for final scenario of a 72m2 house. In the end, when the given money is enough for just half of the house, the key question is, which half do we build? We chose to make the half that a family alone would never be able to achieve on its own, no matter how much money, energy or time they spend. That is how we expect to contribute using architectural tools, to non-architectural questions; in this case, how to overcome poverty. A giant sculpture of a striding man by public artist Andy Scott has been knocked over in a car accident. The 4m (13ft) structure, installed at Muirside roundabout, Tullibody, in Clackmannanshire, is one of five pieces in the county by the artist. It is understood a car crashed into the statue, which sits outside the village police station, at about 2110 GMT on Saturday. Central Scotland Police said they were investigating the incident. 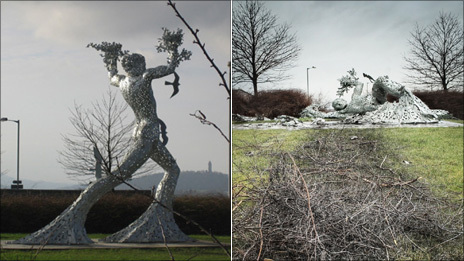 The sculpture – also known as the Man in Motion – is made of welded steel mosaic and has the Wallace Monument and Stirling Castle as a backdrop. Brian Smith, a college lecturer who lives near the sculpture, said the impact of the crash must have been considerable. He said: “Whoever crashed into it has made a fair mess. “It looks like they’ve driven into one of the statue’s legs and brought down abut five or six tonnes of metal. Mr Smith said the erection of the piece in 2008 split the local community. The Year of Culture was a magnificent success for Glasgow. It was a ground-breaking event, which further transformed the city’s image. Unlike its predecessors, its vast cultural programme was scheduled to run throughout the entire calendar year, not just for a few months. Its definition of culture was all-encompassing, incorporating not just music, drama, theatre, and visual arts, but many other fields of human endeavour which characterise Glasgow as a unique, dynamic city: architecture, design, engineering, shipbuilding, education, religion and sport. The statistics were awesome. Over 3,400 public events took place, involving performers and artists from 23 countries. 40 major works were commissioned in the performing and visual arts, and there were 60 world premieres in theatre and dance. Add to that lot some 3979 performances, 656 theatrical productions, and 1901 exhibitions – not forgetting the 157 sporting events. The City of Culture tag allowed Glasgow to showcase many facilities created by the city’s Victorian philanthropists. Prime among these were the magnificent Kelvingrove Museum and Art Gallery housing the richest, most wide-ranging – and most visited– municipal art collection in the UK outside London; the splendid Museum of Transport; and the marvellous Mitchell Library, the largest free public reference library in Europe. Uniquely, too, Glasgow in 1990 was the first British city to implement a strategy where the arts were used as a catalyst for urban regeneration – a revolutionary model which has since been replicated worldwide. The positive economic repercussions of this successful policy have been huge, and are still being felt well into the new millennium. Disney invented Celebration as an ideal American small town. But recession , a brutal murder and a suicide have killed the magic. This was a project archiving and documenting the public art of Cumbernauld which was originally designed and produced by Brian Miller, Cumbernauld’s first and only Town artist. Many of the works have now been destroyed, painted over or faded into obscurity. This website is to be seen as an online archive of the fascinating post war British art which was taking place in Scotland’s most famous New Town. I had the pleasure of taking a field trip to Peterlee, a new town in the north east of England. The basis of the trip was to visit the newly restored Apollo Pavillion, by Victor Pasmore: a public art work and structure based spanning a small lake which divides a housing estate. After its opening in 1955, it became an immediate focus for local complaint. It became a regular target for local youths and the structure became victim of graffiti and vandalism. When the Peterlee Development Corporation was disbanded the local council refused responsibility for cleaning and repair. As a result, the concrete turned grey and began to decay. In 1988, English Heritage recommended the structure be given listed status but this was declined. In 2004, the Baltic Centre for Contemporary Art in Gateshead commissioned Jane and Louise Wilson to make a video installation featuring the Pavilion. In the mid 2000s, there was a proposal to restore the structure and enlarge the lake, so that the Pavilion would be less accessible. Following a meeting at the Pavilion in September 2008, it was agreed that the structure would be repaired with lottery funding. Apollo Pavilion is now widely received by the local community. The local youth of today have now returned to the Apollo Pavillion, but with a new found respect and some very tasteful graffiti.